Our product range includes a wide range of ss onion potato racks and ss plate storage trolley. We are an eminent organization, which is engaged in manufacturing and supplying superior-grade SS Onion Potato Racks. Our offered range of onion potato racks is manufactured using premium quality steel metal, which is procured from the certified vendors of the market. Further, these onion potato racks or vegetable racks have tiny holes in the surface for the easy air flow. 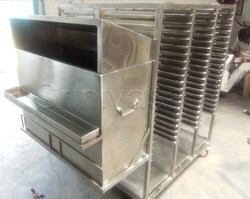 Our Onion Potato Racks can be used as Commercial Kitchen Equipments. For our valuable customers, we bring forth a broad range of SS Plate Storage Trolley. Designed in complete compliance with the universal standards, these products are manufactured using optimum quality factor inputs and latest technology. Offered in different customized options, these products can also be purchased at market leading rates. In addition to this, the offered trolley is checked on variegated measures in order to deliver defect free range at clients’ premises.